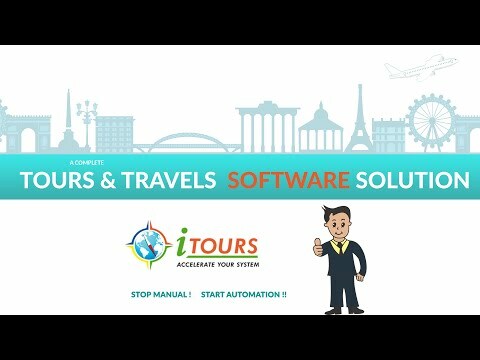 iTours- Tour Operator Software is specially designed to take care of all the business needs of travel agencies with its incredible and 100% user-friendly features. Crafted with utmost coherence, this travel management system proves to be an end-to-end solution for small to large businesses. It is a popular tour management system that takes care of everything from CRM to finance, reporting, billing, invoicing, customer information and accounting. iTours is an IT web services provider having 6 years of experience in creating solutions with the experienced and skilled team to support the evolving needs of the businesses. The company provides services and solutions across India and overseas. The company is a proud creator of several established and tailored products for its clients spread across the globe. An overview of all bookings within seconds along with the payment status of received and outstanding amounts too for all tours in one-go. All tour CRM software need to be designed for assisting the travel business and that’s what ITours does in the best possible way. It minimizes time spent on complex and tiring activities like calculating and tallying. Experience faster and simpler lead management. ITours – the most preferred tour CRM software gives you customized reports of your leads as per their status; you can set periodic follow-up alerts if required. This exclusive tour agency CRM software comes as an ideal package of 40+ amazing features. Send quick and bulk SMS and email alerts to your vendors, team members, agents and customers too with this complete tour operator CRM software. It works to set you free from the tedious and time-consuming activities. ITours aims at simplifying your work. You can schedule the alerts for future activities too. ITours has everything that you wish for in the perfect tour company accounting software; it has all the ready-to-use features and still has ample opportunity for customization as per your choice and requirements. Take your travel business entirely online with this automated, accurate and safe online tour accounting software enabling you to manage and track the financial aspects in a seamless way. You can view, download and print various customized reports as per your varying needs. Create tours with details and options in the system. Make them available local partners, tour agents as per the geographical locations, booking availability and booking status. Assign the bookings to particular agents as per your plan. Agents will update the bookings in the system, and you will have the updated status of bookings whenever you need. ITours comes with individual login option for every user and the admin can allow access of modules as per the type of user. Every user gets what he/she needs to complete the desired activities. ITours is the first software which offers the login feature for customers too. ITours helps you with simplest and fastest task management. All your team would be using the software, and you can allocate responsibilities online with a single click. Upload location wise lists of hotels, transportation service providers and you can get the required information within seconds when needed. ITours is the easiest way to connect with your customers, get customer feedback instantly and serve them better. Customers can post their reviews once they log in to software. ITours as tour booking software not only helps you with booking process but with its feature of customer login, your customers can instantly connect with you with their feedback and suggestions which help you to serve them better. Employee administration process only providing required tabs & reports as per user role to enhance security & performance. New Tours Registration, add upcoming Tours with Pricing, Dates, Capacity, Discounts, Tax & more to perform accurate delivery. iTours an advanced Tours & Travels Operator software solutions. Call Us for Demo : +91 9096685012. Email : info@itwebservices.co www.itouroperatorsoftware.com Delivering complete CRM, Accounting, MIS, Promotion, Billing, Reporting, SMS, Emails and much more features for Back Office management. iTours is most powerful & customized web-based tour agency ERP solution gives 100% productivity. Start Online demo now! Tour operator software, Tour Agency Software, Tours company software, Tour Booking Software, Tours CRM Software, Tours accounting software, Online Tours & Travel Management Software.